Raymond Hart Massey (August 30, 1896 – July 29, 1983) was a Canadian actor, known for his commanding, stage-trained voice. For his lead role in Abe Lincoln in Illinois (1940), Massey was nominated for the Academy Award for Best Actor. He also was well known for playing Dr. Gillespie in the NBC television series Dr. Kildare (1961–1966). Today he is most often seen in his role as the malevolent Jonathan Brewster, who looks like Boris Karloff, and violently attacks anyone who mentions the resemblance, in Arsenic and Old Lace (1944). Massey was born in Toronto, Ontario, the son of Anna (née Vincent), who was American-born, and Chester Daniel Massey, the wealthy owner of the Massey-Harris Tractor Company. He was the grandson of businessman Hart Massey and great-grandson of founder Daniel Massey. His branch of the Massey family emigrated to Canada from New England a few years before the War of 1812, their ancestors having migrated from England to the Massachusetts colony in the 1630s. He attended secondary school briefly at Upper Canada College before transferring to Appleby College in Oakville, Ontario, and taking several courses at University of Toronto, where he was an active member of the Kappa Alpha Society. Massey joined the Canadian Army at the outbreak of World War I, and served on the Western Front in the Royal Regiment of Canadian Artillery. Lieutenant Massey returned to Canada after being wounded at Zillebeke in Belgium during the Battle of Mont Sorrel in 1916 and was engaged as an army instructor for American officers at Yale University. In 1918, he was recalled to active service and joined the Canadian Siberian Expeditionary Force that went to Siberia during the Allied intervention in the Russian Civil War. On the orders of his commanding general, he organized a minstrel troop with himself as end man to bolster morale of allied troops on occupation duty in Vladivostok. After returning home in 1919, he graduated from Balliol College, Oxford. He later went to work in the family business, selling farm implements, but he was drawn to the theater. He persuaded his reluctant family to allow him to pursue this career. In 1942, Massey rejoined the Canadian Army in World War II, and served as a major in the adjutant general's branch of the Canadian Army. After being wounded, he was invalided from the Canadian Army in 1943 and became an American citizen in 1944. He first appeared on the London stage in 1922 in Eugene O'Neill's In the Zone. According to his obituary in The New York Times, he appeared in "several dozen plays and directed numerous others" in England over the next decade. The Washington Post credited him with performances in over 80 plays, including Pygmalion with Gertrude Lawrence; Ethan Frome with Ruth Gordon; and the George Bernard Shaw works The Doctor's Dilemma and Candida with Katharine Cornell. In 1929, he directed the London premiere of The Silver Tassie. He received poor reviews in his debut on Broadway in an unorthodox 1931 production of Hamlet. The first movie he was in was High Treason (1928). In 1931, he played Sherlock Holmes in The Speckled Band, the first sound film version of the story. In 1934, he played the villain in The Scarlet Pimpernel, and in 1936, he starred in Things to Come, a film adaptation by H.G. Wells of his own speculative novel The Shape of Things to Come (1933). In 1944, Massey played the district attorney in Fritz Lang's classic film noir The Woman in the Window, which starred Edward G. Robinson and Joan Bennett. He portrayed the American Revolutionary War character Abraham Farlan, who hated the British for making him a casualty of that war, in the 1946 film A Matter of Life and Death (titled Stairway to Heaven in the U.S.). Despite his being Canadian, Massey became famous for playing archetypal American historical figures. He played abolitionist/insurrectionist John Brown in two films: Santa Fe Trail (1940) and again in the low-budget Seven Angry Men (1955). The character of Brown is portrayed as a wild-eyed lunatic in Santa Fe Trail, whereas he is a well-intentioned but misguided character in the more sympathetic Seven Angry Men. Massey scored a great triumph on Broadway in Robert E. Sherwood's Pulitzer Prize-winning play Abe Lincoln in Illinois despite reservations about Lincoln's being portrayed by a Canadian. He repeated his role in the 1940 film version, for which he was nominated for the Academy Award for Best Actor. Massey again portrayed Lincoln in The Day Lincoln Was Shot on Ford Star Jubilee (1956), a wordless appearance in How the West Was Won (1962), and two TV adaptations of Abe Lincoln in Illinois broadcast in 1950 and 1951. He once complained jokingly that he was "the only actor ever typecast as a president." His preparation for the role was so detailed and obsessive that one person commented that Massey would not be satisfied with his Lincoln impersonation until someone assassinated him. On stage in a dramatic reading of Stephen Vincent Benét's John Brown's Body (1953), Massey, in addition to narrating along with Tyrone Power and Judith Anderson, took on the roles of both John Brown and Lincoln. Raymond Massey played a Canadian on screen only once in 49th Parallel (1941). During World War II, he teamed up with Katharine Cornell and other leading actors in a revival of Shaw's Candida to benefit the Army Emergency Fund and the Navy Relief Society. 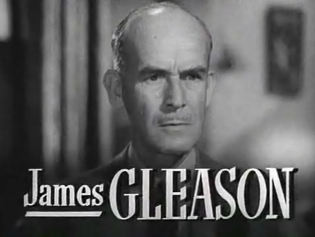 Massey portrayed Jonathan Brewster in the film version of Arsenic and Old Lace. The character had been created by Boris Karloff for the stage version, and a running gag in the play and the film was the character's resemblance to Karloff. Even though the film was released in 1944, it was shot in 1941, at which time Karloff still was contracted to the Broadway play and could not be released for the filming (unlike his costars Josephine Hull, Jean Adair and John Alexander). Massey and Karloff had appeared together earlier in James Whale's suspense film The Old Dark House (1932). After Massey became an American citizen, he continued to work in Hollywood. Memorable film roles included the husband of Joan Crawford during her Oscar-nominated role in Possessed (1947) and the doomed publishing tycoon Gail Wynand in The Fountainhead (1949), with Patricia Neal and Gary Cooper. In 1955, he starred in East of Eden as Adam Trask, father of Cal, played by James Dean, and Aron, played by Richard Davalos. 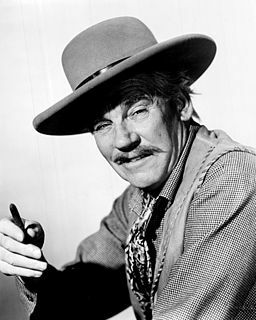 Massey became well known on television in the 1950s and 1960s. He was cast in 1960 as Sir Oliver Garnett in the episode "Trunk Full of Dreams" of the NBC series Riverboat. Massey is remembered as Dr. Gillespie in the popular 1961-1966 NBC series Dr. Kildare, with Richard Chamberlain in the title role. Massey and his son Daniel were cast as father and son in The Queen's Guards (1961). Massey was married three times. Margery Fremantle from 1921 to 1929 (divorce); they had one child, architect Geoffrey Massey. Adrianne Allen from 1929 to 1939 (divorce); Allen was a stage actress in London and on Broadway. They had two children who followed him into acting: Anna Massey and Daniel Massey. Dorothy Whitney from 1939 until her death in 1982. His high-profile estrangement and divorce from Adrianne Allen was the inspiration for Ruth Gordon's and Garson Kanin's script for the film Adam's Rib (1949), starring Katharine Hepburn and Spencer Tracy, and indeed Massey married the lawyer who represented him in court, Dorothy Whitney, while his then former wife, Allen, married the opposing lawyer, William Dwight Whitney. Massey's older brother, Vincent Massey, was the first Canadian-born governor general of Canada. Massey also dabbled in politics, appearing in a 1964 television advertisement in support of the conservative Republican presidential nominee Barry Goldwater. Massey denounced U.S. President Lyndon B. Johnson for a "no-win" strategy in the Vietnam War, suggesting that Goldwater would pursue an aggressive strategy and win the war quickly. Massey died of pneumonia in Los Angeles, California on July 29, 1983, a month before he would have turned 87. His death came on the same day as that of David Niven, with whom he had co-starred in The Prisoner of Zenda and A Matter of Life and Death. Massey is buried in New Haven, Connecticut's Beaverdale Memorial Park. Massey has two stars on the Hollywood Walk of Fame, one for films at 1719 Vine Street and one for television at 6708 Hollywood Boulevard. His achievements also have been recognised in a signature cocktail, the Raymond Massey. 1959 Alfred Hitchcock Presents Colonel Archie Dittman Season 5, episode 11, "Road Hog"
1960 Wagon Train Montezuma IX Season 4, episode 6, "Princess of a Lost Tribe"
Doctor Glendon Season 1, episode 4, second segment: "Clean Kills and Other Trophies"
Season 3, episode 4: "Rare Objects"
^ a b c d e f "Raymond Massey, Famous For His Portrayal Of Lincoln". The New York Times. Associated Press. July 31, 1983. ^ a b c d "Raymond Massey, Noted For Lincoln Roles". The Washington Post. July 31, 1983. ^ "Lieutenant Raymond Hart Massey". Canadian Great War Project. 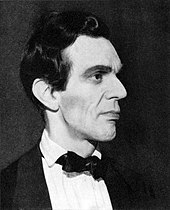 ^ "Raymond Massey, the Canadian-born actor who was Abraham Lincoln..." United Press International. July 30, 1983. ^ "Lieutenant Raymond Hart Massey". www.canadiangreatwarproject.com. Retrieved May 30, 2018. ^ Foster, Charles (2003). Once Upon a Time in Paradise: Canadians in the Golden Age of Hollywood. Dundurn. p. 226. ISBN 978-1-55002-997-0. ^ Fisher, James (2011). Historical Dictionary of Contemporary American Theater: 1930-2010. Scarecrow Press. p. 20. ISBN 978-0-8108-7950-8. ^ Dirks, Tim. "Adam's Rib". American Movie Classics. Retrieved November 22, 2011. ^ Eagan, Daniel (2010). America's Film Legacy: The Authoritative Guide to the Landmark Movies in The National Film Registry. London: the Continuum International Publishing Group. ISBN 978-0826429773. ^ "Raymond Massey and Sylvia Sidney in 'Wuthering Heights'". Harrisburg Telegraph. October 11, 1941. p. 26. Retrieved July 21, 2015 – via Newspapers.com. ^ "The Short and Long of Radio". The Evening News. Harrisburg. April 17, 1942. p. 16. Retrieved August 1, 2015 – via Newspapers.com. ^ "Radio's Golden Age". Nostalgia Digest. 37 (1): 40. Winter 2011. ^ Kirby, Walter (February 10, 1952). "Better Radio Programs for the Week". The Decatur Daily Review. p. 38. Retrieved June 2, 2015 – via Newspapers.com. Wikimedia Commons has media related to Raymond Massey. William Henry Pratt, better known by his stage name Boris Karloff, was an English actor who was primarily known for his roles in horror films. He portrayed Frankenstein's monster in Frankenstein (1931), Bride of Frankenstein (1935) and Son of Frankenstein (1939). He also appeared as Imhotep in The Mummy (1932). Philip St. John Basil Rathbone MC was a South African-born English actor. He rose to prominence in the United Kingdom as a Shakespearean stage actor and went on to appear in more than 70 films, primarily costume dramas, swashbucklers and, occasionally, horror films. Walter Thomas Huston was a Canadian actor and singer. Huston won the Academy Award for Best Supporting Actor for his role in The Treasure of the Sierra Madre, directed by his son John Huston. He is the patriarch of the four generations of the Huston acting family, including his son John, Anjelica Huston, Danny Huston, Allegra Huston and Jack Huston. The Huston family has three generations of Academy Award winners: Walter, his son John and John's daughter Anjelica. Abe Lincoln in Illinois is a 1940 biographical film which tells the story of the life of Abraham Lincoln from his departure from Kentucky until his election as President of the United States. Daniel Raymond Massey was an English actor and performer. He is possibly best known for his starring role in the British TV drama The Roads to Freedom, as Daniel, alongside Michael Bryant. He is also known for his role in the 1968 American film Star!, as Noël Coward, for which he won a Golden Globe Award and an Oscar nomination. Powers Allen Boothe was an American television, video game, and film actor and voice actor. Some of his most notable roles include his Emmy-winning portrayal of Jim Jones in Guyana Tragedy: The Story of Jim Jones and his turns as TV detective Philip Marlowe in the 1980s, Cy Tolliver on Deadwood, "Curly Bill" Brocius in Tombstone, Vice President and subsequently President Noah Daniels on 24, and Lamar Wyatt in Nashville. Barry Nelson was an American actor, noted as the first actor to portray Ian Fleming's secret agent James Bond. Arsenic and Old Lace is a 1944 American dark comedy film directed by Frank Capra, starring Cary Grant, and based on Joseph Kesselring's play Arsenic and Old Lace. The script adaptation was by Julius J. Epstein and Philip G. Epstein. Capra actually filmed the movie in 1941 because of star Cary Grant's availability, but it was not released until 1944, after the original stage version had finished its run on Broadway. The lead role of Mortimer Brewster was originally intended for Bob Hope, but he could not be released from his contract with Paramount Pictures. Capra had also approached Jack Benny and Ronald Reagan before learning that Grant would accept the role. Boris Karloff played Jonathan Brewster, who "looks like Karloff," on the Broadway stage, but he was unable to do the film as well because he was still appearing in the play during filming, and Raymond Massey took his place. The film's supporting cast also features Priscilla Lane, Jack Carson, Edward Everett Horton and Peter Lorre. Harold Rowe Holbrook Jr. is an American actor, television director and writer. He first received critical acclaim in 1954 for a one-man stage show he developed, Mark Twain Tonight, while studying at Denison University, performing as Mark Twain. He won Tony Award for Best Actor in a Play in 1966 for his portrayal of Twain. Throughout his career, he won five Primetime Emmy Awards. James Austin Gleason was an American actor born in New York City. He was also a playwright and screenwriter. Dwight Iliff Frye was an American character actor of stage and screen. He is best known for his portrayals of neurotic, murderous villains in several classic Universal horror films, such as Renfield in Dracula (1931) and Fritz in Frankenstein (1931). Abe Lincoln in Illinois is a play written by the American playwright Robert E. Sherwood in 1938. The play, in three acts, covers the life of President Abraham Lincoln from his childhood through his final speech in Illinois before he left for Washington. The play also covers his romance with Mary Todd and his debates with Stephen A. Douglas, and uses Lincoln's own words in some scenes. Sherwood received the Pulitzer Prize for Drama in 1939 for his work. 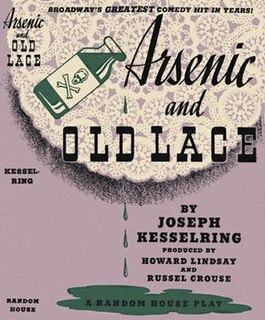 Arsenic and Old Lace is a play by American playwright Joseph Kesselring, written in 1939. It has become best known through the subsequent film adaptation starring Cary Grant and directed by Frank Capra. Torben Emil Meyer was a Danish character actor who appeared in more than 190 films in a 55-year career. Since his death in 1865, Abraham Lincoln has been an iconic American figure depicted—usually favorably or heroically—in many forms. Lincoln has often been portrayed by Hollywood, almost always in a flattering light. Herbert Rudley was an American character actor who appeared on stage, films and on television.